If you know of criminal activity in your area, please call the Bagley hotline (313-927-2674) or email Bagleycommunitycouncil@yahoo.com. Give as much information as possible: type of crime, location of crime (address), car license plate, description, etc. The information will be reported for you. Neighborhood Watch Sticker is good to place in windows and doors. Download HERE and have it laminated. Detroit Fab, 18480 Mt. Elliot, have created made to fit cages to secure your unit from theft. They also have an electronic sensor that can be tied into your current alarm system. They can be reached at 313-891-7181 or 586-718-3810. This information was provided by the 12th precinct. Being proactive is the key to preventing home break-ins. There are only two ways to enter the home…..a door or a window. Let’s start with the doors. First and foremost, all exit doors should be made of solid wood or metal. Hollow doors can be punched out. The best locks to attach on the doors are deadbolt locks with a one inch bolt. Shorter bolts can be pried out of the door jamb. The strike plate and the hinges are the keys to your doors not being forced open (kicked in). The strike plate and hinge screws should be long enough to reach the wall studs (3-4 inches) This will help to protect the doors against a forced entry attack. Finally, lets talk about the windows. All windows should be alarmed or have bolt locking devices attached. Window Bolt locks can be purchased for under $20.00 at the large home improvement stores. You can put a nail between the two sashes on double hung windows or put a block of wood in the window to keep them from being forced open. Security bars are an option, but keep in mind one set should be installed inside the home and a child should be able to unlock them and get out in case of a fire. IMPORTANT: Burglars will always knock on your door before they break in. Watch for suspicious persons or cars and report them to (911) as soon as you are sure they are casing the neighborhood. IMPORTANT: Your safety is law enforcement’s first priority!! Don’t let the thieves steal your car tires. Before you get out of the car, turn your wheels to the left or right (cut your wheels). This will lock them in place and make them difficult if not impossible to steal. 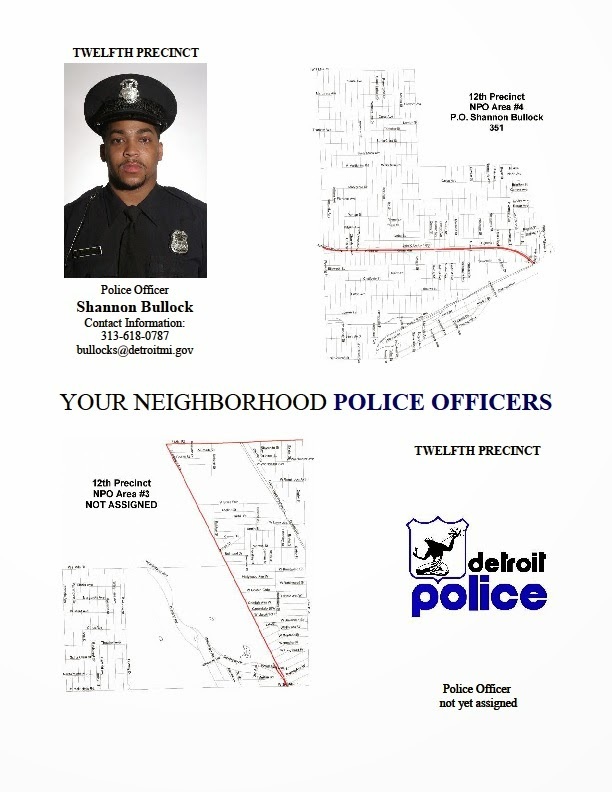 Click here to read the Detroit Police Department’s Plan Of Action to reduce crime. The Bagley Community is in District 2. The 12th police precinct is the precinct for District 2. Click here to download the information. Please see the map the see the area each officers is assigned. Officer Crowder is assigned to North of 7 mile which begins at 19100 Ohio and up. ATTENTION: There is a new gang called “The Band” this group of individuals have to complete and initiation in order to be in the gang. Their target area is 8 Mile Rd. & Greenfield to North on 7 Mile Road to the Lodge Fwy. Please be advised that they are breaking into homes and stealing jewelry. There is two cars that pull up in front of your house one car invades the home while the other car watches. So that they can complete their initiation into “The Band”. Several homes have been broken into in the last week. They don’t care if you are home or not. Crimes occur at night between the hours of 9:00pm to 11:00pm. Their target is the elder and single women. Please take caution. Cut more lights on. Let your neighbors know. Watch out for one another. Sources of this action has been confirmed. Be careful! If you see any vacant homes that have front, back doors, or windows open, report it to the the Buildings Safety Engineering, and Environmental Department (313) 224-3251. Did you know your house/block will be put on special attention? A police car will drive around the block (when there are no other assignments) for three days. If you are able to close doors, windows, or board the ‘open’ areas up please do so. Protect yourself and your neighbors. 7. A good security company alarms the window over the sink and the windows on the second floor, which often access the master bedroom – and your jewelry. It’s not a bad idea to put motion detectors up there too. 3. I’ll break a window to get in, even if it makes a little noise. If your neighbor hears one loud sound, he’ll stop what he’s doing and wait to hear it again… If he doesn’t hear it again, he’ll just go back to what he was doing. It’s human nature. Convicted burglars in North Carolina, Oregon, California, and Kentucky. Richard T. Wright, a criminology professor at the University of Missouri-St. Louis, who interviewed 105 burglars for his book Burglars on the Job. A receptionist in a church in a high risk area was concerned about someone coming into the office on Monday to rob them when they were counting the collection. She asked the local police department about using pepper spray and they recommended to her that she get a can of wasp spray instead. The wasp spray, they told her, can shoot up to twenty feet away and is a lot more accurate, while with the pepper spray, they have to get too close to you and could overpower you. The wasp spray temporarily blinds an attacker until they get to the hospital for an antidote. She keeps a can on her desk in the office and it doesn’t attract attention from people like a can of pepper spray would. She also keeps one nearby at home for home protection. Thought this was interesting and might be of use. This would also be useful for any emergency, such as a heart attack, where you can’t reach a phone. Carry your car keys when outside in case you fall outside. You can activate the car alarm and then someone will know there’s a problem. You can be a court watcher as individuals who have committed crime are sentenced before a judge. By filling the courtroom you can send the message that YOU do not want crime in Detroit. Be on the lookout. There was a story on the news showing a teenager (young man) on the roof of a home. The police suspected he was there to rob the home. If you see this type of suspicious activity, call 911 or your local police precinct. If you are a senior citizens you don’t have to drive in a CB patrol to help fight crime in Detroit. You can watch from your house. Watch children walking to and from school from your window. When the the weather is nice, watch from your front porch. Call the police when you see something suspicious. AmeriCorps (through Wayne State University and State of Michigan) has started a door to door campaign to create a neighborhood patrol block by block. The Bagley Community Council is participating in this. If we can get a neighborhood patrol then we can have a direct line to the police department. With other block groups that have neighborhood patrols, when one of them calls the police, the police respond quickly. The two meetings held about the neighborhood patrol was very informative. If you would like to patrol your neighborhood, call the Bagley Community hotline (313) 927-2674 or email BagleyCommunityCouncil@yahoo.com. The powerpoint presentation from the meetings can be read here. If you choose to contact the names listed on the powerpoint presentation for patrolling, please state that you are in the Bagley Community and are interested in patrolling. Let us be a part of this. No one can protect your house and your neighborhood like you can. Be a part of the decisions that are made about the community you live in. Your presence can deter crime. Want to leave in a safe area? It starts with you. Get involved and make it safe. Patrol your Block Join The Bagley Community Patrol. http://bagleycommunity.blogspot.com/2013/09/walk-with-us-patrol-your-block.html The next Bagley Radio Patrol meeting is the 3rd Saturday of every month immediately following the Bagley Community meeting 10am at the 12th police precinct. This is a GOOD and INEXPENSIVE way to prevent crime. People who want to commit a crime will think twice when they see others walking. A good way to meet your neighbors. A walking club is taking place every Saturday morning at 9:00 am on the Livernois Avenue Of Fashion. The office of public affairs with the FBI Citizens Academy classes at the PV McNamara Federal Building, 477 Michigan Ave, Detroit, MI 48226. If you are interested, you may contact the Bagley Community Council hotline 313.927.2674 or email BagleyCommunityCouncil@yahoo.com to receive an application. (http://www.1800speakup.org/) or Text: CSM and your tips to CRIMES (274637). If you see a crime taking place in the Bagley Community, you can call 911 who will call the 12th police precinct. The 12th police precinct number is (313) 596-1200. If you see bullying, gang activity, sexual assualts, fighting, or your safety is threatened call (313) 748-6000. To volunteer with the Detroit Youth Violence Initiative call (313) 224-1098. To see the crime in your area, click the Crime Mapping link http://www.crimemapping.com/, type in your address, City, State, and Zipcode. Click the search button. · If you must leave your key with a valet, attendant, or mechanic leave only the ignition key. Make sure you are dealing with a reputable firm. · In high theft areas the Vehicle Identification Number (VIN) should be etched on windows, doors, fenders and trunk lid. This makes it difficult for a thief to market your stolen car parts. · Many vehicles today come with some type of security system from the factory. Normally there are upgraded systems available if you ask. The best choice are systems that shut off the fuel supply so that a car can’t be started or driven. The City of Detroit has partnered with local, state and federal law enforcement agencies and neighborhood organizations to reduce crime in Detroit. The various agencies working together are: Wayne County Prosecutor’s Office; Wayne County Sheriff’s Office; Governor’s Office; Michigan State Police; and Michigan Department of Corrections, U.S. Attorney’s Office, the Bureau of Alcohol, Tobacco and Firearms (ATF); Federal Bureau of Investigations (FBI); Drug Enforcement Administration (DEA); Homeland Security Investigations (HSI); Michigan High Intensity Drug Trafficking Area (HIDTA); and the U.S. Marshal’s Service. It has been reported that a new scam is being practiced throughout Detroit. The latest is that someone will ring your door bell or knock after midnight, and you will hear a baby crying. Those who have opened the door have been robbed at gun point. A house has been torn down on the corner of Indiana and Thatcher. If you see any illegal dumping at this location, please report it. We want the Bagley Community to be neat, clean, and look nice. You can make Detroit a model city for the nation, with its low crime rate. Preventing Auto Theft…. Good advice from our friends @ Rosedale/Grandmont! The DPD tell us that these car thieves are always out there cruising the neighborhood in the early morning hours (2 am til 5 am??) looking for the cars or the parts. Even parking a car in the driveway, up near the garage has resulted in stolen tires – mostly from new cars. Best Advice: Clean out that garage and put the cars in there. If have 3 cars, make sure you have car alarms on your car. They should go off if the car is moved although some of these folks are “very professional” and have removed tires without shaking the car enough to set off these alarms, although that is not typical. Car tire locks will slow some people down but can be beat by the really good criminals. Bottom Line: No guarantees here but cars in garages, alarms, car tire locks – can help prevent the cruising criminals from seeing what you’ve got and from taking what you got. One night I was tired and did not put my car in the garage. I did not have an alarm at that time. (I do now.) I came out the next am with no Air Bags in my car. Furthermore, only a tiny back window was broken and the thief neatly tucked the remaining wires into the steering wheel. Very neat professional job! A year or two ago, one neighbor heard a slight noise during the night and he always checks. Looked out side window to see two car tire thieves, dressed all in black, using hand signals to each other, not talking, while they started removing the tires. He couldn’t get the neighbor on the phone (had changed numbers without telling others) so he put up the blind, created noise, and the perps ran off immediately. Do You Have Wheel Locks On Your Car? If you have wheel locks, please do not leave the lock in your glove box since thieves are beginning to look there for them. Also, if you have a garage, PLEASE USE IT. There are several communites within the 12 precinct boundaries which have helped reduced crime. The 12th police precinct wants to reach out to other communities. Would anyone be interested in volunteering their time in making phone calls from the 12th precinct? A message will be prepared specific to the crime concerns in each area. Working with Sergeant Bledsoe, information on establishing block clubs, neighborhood watches, citizen band radio patrols etc. will be included. The possibility of having a ROBO dialing system is being looked into (computerized dialing system). If you are interested in making phone calls please contact Sergeant Bledsoe at 313-596-1221 to coordinate scheduling. There is a desk and phone waiting for you. The Executive Team For The Detroit Police Department can be found at this link. The Detroit Police Department is eager to provide every resident of Detroit with news and other information that matters in neighborhoods. If you would like to regularly receive safety tips, crime alerts or details regarding upcoming activities, please send your e-mail address to PUBINFO@dpdhq.ci.detroit.mi.us with a subject header of DPD Mailing List. Participating community newsletter editors will benefit greatly by receiving important information directly from the Detroit Police Department that can be distributed to their readers. All categorized information in CrimeView Community is preliminary. Please refer to the FBI Web site at http://www.fbi.gov/ucr/ucr.htm for the official City of Detroit crime statistics. For additional information, please contact the Office of Public Information at 313-596-2200. If you are aware that the above information needs to be updated please email bagleycommunitycouncil@yahoo.com or call (313) 927-2674.